Angelo Michele Pisani first appears in the Painesville, Ohio, area between 1928 and 1936. 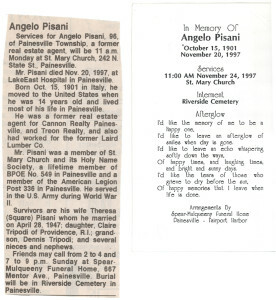 In America, Angelo Michele Pisani was known as Angelo Pisani. Angelo Michele Pisani, son of Sabastiano Pisani and Clementina Fiella, was born on October 15, 1901, at Sant’Angelo in Grotte, Italy. He married first, Dora Pasquarosa, in 1922, at Franklin, Norfolk County, Massachusetts. Angelo and Dora were divorced about 1929. Angelo married second, Theresa Ann (Tracy) Square, daughter of Giovanni Scacciavillani and Anna Antonia Cardegna, on April 29, 1948 at Painesville, Lake County, Ohio. Angelo died on November 20, 1997 at LakeEast Hospital at Painesville, Lake County, Ohio, at age 96, due sudden cardiac death syndrome. Angelo collapsed in the kitchen of his Briar Hill, Painesville Township, home. His wife, Tracy, was with him, and called for help. His body was interred at Riverside Cemetery at Painesville, Lake County, Ohio. 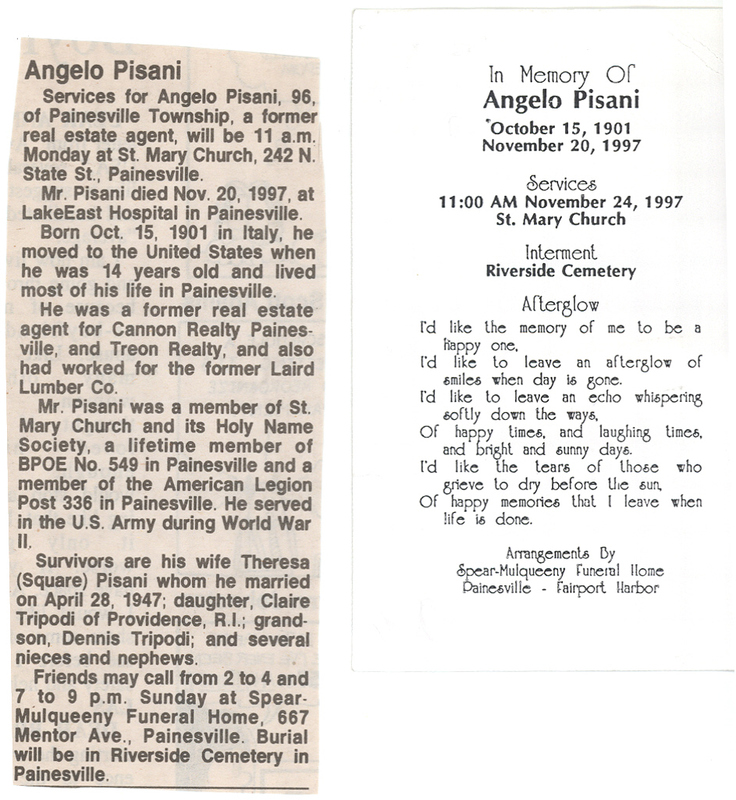 Angelo Pisani, age 14, immigrated to the United States on 15 June 1916. He entered the United States at the Port of Boston. Angelo settled on the East Coast of the United States and married. He divorced and migrated to Painesville between 1928 and 1936. Angelo’s sister, Maria Pisani Mucciarone, was a Painesville resident since 1929. Angelo Michele Pisani became a citizen of the United States on March 4, 1940. Angelo resided at 383 West Jackson Street, Painesville, Lake County, Ohio, when he was naturalized. Angelo was a Real Estate broker. 1. Claire Pisani, was born on April 6, 1928. Her married name is Claire Tripodi. There were no children of Angelo Michele Pisani and Theresa Ann Square.